A runny nose, rough throat, and continuous sneezing- you can’t overlook the signs of a cold. Have you ever thought, why do you seem to get cold so often while your close friend stays well? Mystery envelops a lot of other things about it. Cold is communicable from the person who is infected with the virus. This illness usually happens when you touch surface that has bacteria on it and then comes in contact with your nose and mouth. A healthy person can also catch it if someone sneezes into the air. The cold begins when the virus gets attached to the lining of the nose and throat. Here we discussed some best ways to use apple cider vinegar for colds. Does Apple Cider Vinegar Cure a Cold? How to Use Apple Cider Vinegar for Colds? ACV helps in cleaning ablocked nose. Drinking it in diluted form can help to break the mucus. It contains a heavy amount of minerals like Potassium, calcium, iron and magnesium which helps to cure cold and cough, thus acting as a natural medicine. It fights infection due to anti- infective quality. It regulates the body’s pH level thus reducing the risk of illness. It is filled with Vitamins and boosting acetic acid which act as ultimate medication to cure a cold. Apple cider vinegar or ACV is pretty marvellous stuff. But did you know how it can be beneficial in preventing cold and flu? 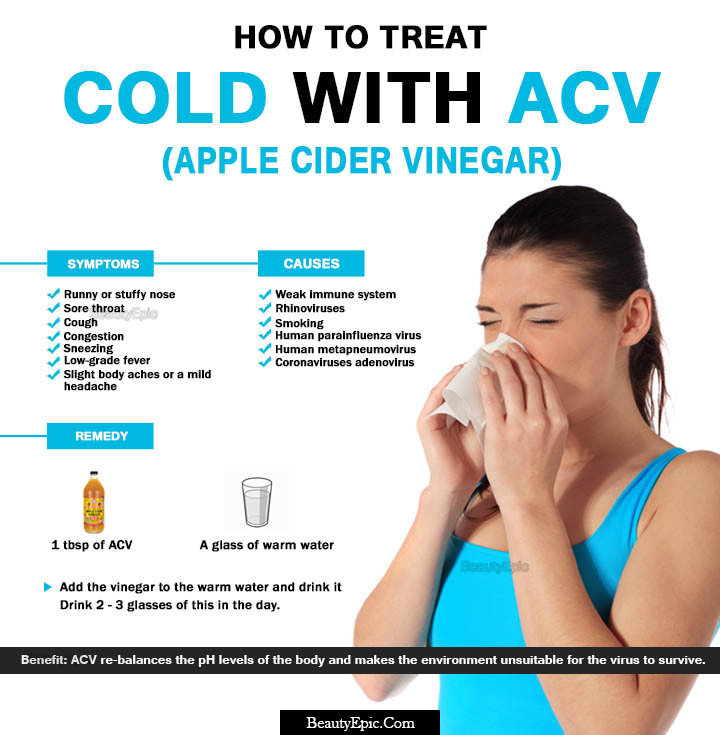 Instead of using cough syrups and mind-numbing medicines try these natural remedies for curing a cold with ACV. 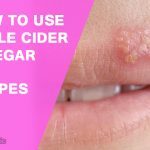 Drink the apple cider vinegar in the initial stage of the infection. Repeat the above steps daily. this process relieves the person from the flu, cold and infections. Add 2 teaspoon of mixture in the glass and drink daily on an empty stomach till you find relief from cold. Lay across the chest for half an hour and rise off the water it will provide relief from the chest congestion. Repeat this process two times a day. Boil a ¼ cup of water. After removing from flame add ¼ cup of Apple cider vinegar. Drink it and repeat the process daily. Take the mixture twice a day. Use ACV in salads regularly. Drinking Apple cider vinegar on an empty stomach can cause nausea to the person. Any person can burn their oesophagus unless they learn to drink it in a right way. Intake of apple cider vinegar may cause unpleasant indigestion, appetite, and food digestion may decrease at the initial stage. 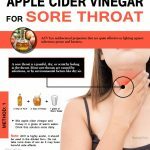 ACV has the potential to cause the throat burn. It should be kept away from children due to its acidic nature. Vinegar can also cause burns to skin. However, do a patch test before applying it to the infected area. If your stomach is unable to cope up with the burning sensation dilute the vinegar by squeezing the lemon to minimise it’s acetic acid. It is highly recommended to the diabetic patients not to take apple cider vinegar as it can react with insulin. Since it’s acidic in nature it can react with some medicines, People with High Blood Pressure are suggested not intake the vinegar. Regular absorption of vinegar can make bones weak and brittle. Completely discard the consumption of alcohol with the ACV. Always buy vinegar in raw form which is composed of ingredient “The Mother” which promotes the growth of healthy bacteria. Try above simple and tested remedies instead of taking harsh antibiotics all through the year. Start using the vinegar and you will not have a single cold infection. Next time if you are suffering from cold, grab apple cider vinegar and improve your health and life. Drinking the vinegar in the concentrated cab upset your stomach; dilute it with water and some maple syrup. This is a natural cure for the cold, it helps to thin down mucus and neutralize the body making it alkaline when sick. It has the ability to kill “bad” bacteria in body and at the same time stimulate growth of “good” bacteria. It is a truly magical remedy that can heal and safeguard human body. How Does Apple Cider Vinegar Stop Coughing?